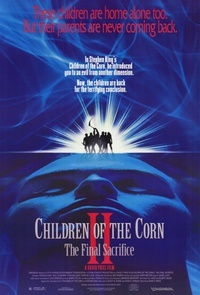 Children of the Corn II: The Final Sacrifice is the sequel to the 1984 movie Children of the Corn. This sequel, directed by David F. Price, stars Terence Knox, Ryan Bollman, Ned Romero, and Paul Scherrer. The film was released in 1992 in Germany and in theatres by Dimension Films in January 1993, with the video release handled by Paramount Pictures. Several sequels followed this movie, all but one of which were released directly to video. This webpage uses material from the Wikipedia article "Children_of_the_Corn_II%3A_The_Final_Sacrifice" and is licensed under the GNU Free Documentation License. Reality TV World is not responsible for any errors or omissions the Wikipedia article may contain.